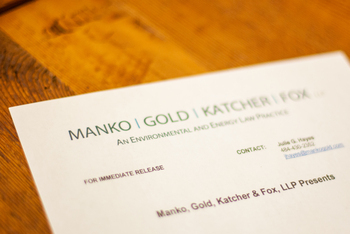 Jonathan E. Rinde, partner at Manko, Gold, Katcher & Fox, LLP served as a panelist for a seminar entitled, “Pennsylvania Water Laws and Regulations” held on Thursday, February 4, 2016. His portion focused specifically on federal and state wetland and water permitting. Rinde helped attendees understand section 404 of the Clean Water Act and the Department of Environmental Protection’s section 105 regulations, and provided practice pointers for engineers and lawyers to streamline the permitting process.